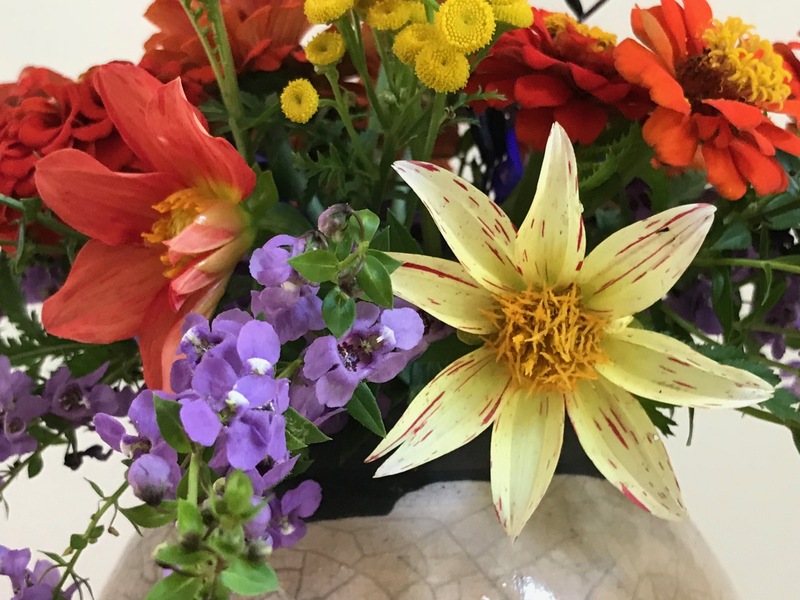 Cathy at Rambling In The Garden generously invites us to share an arrangement every Monday using materials collected from our gardens. 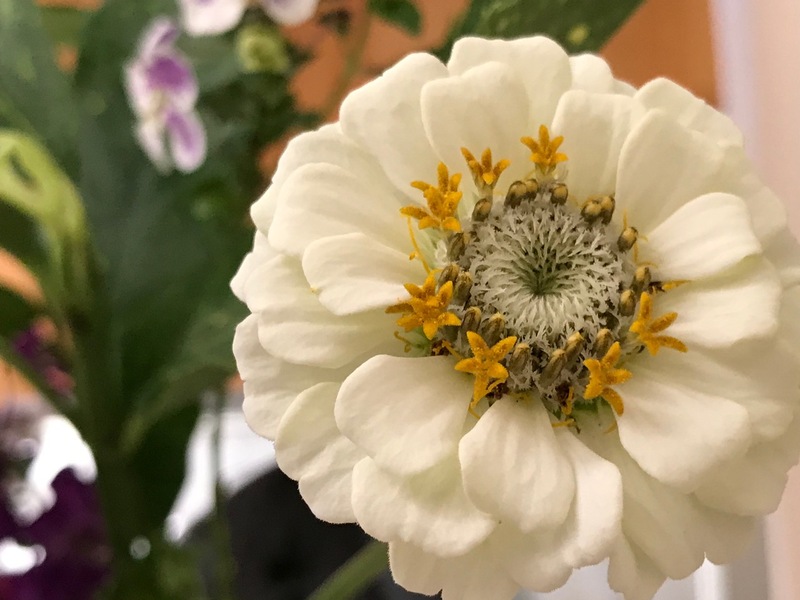 From the Zinnia Cut and Come Again collection I picked dozens of colorful blooms yesterday, but only one zinnia found its way toward the back of today’s design, a rare white one. Having planned to focus on foliage this week I collected a large piece of Gold Dust Aucuba and an arching stem of Sarcococca. 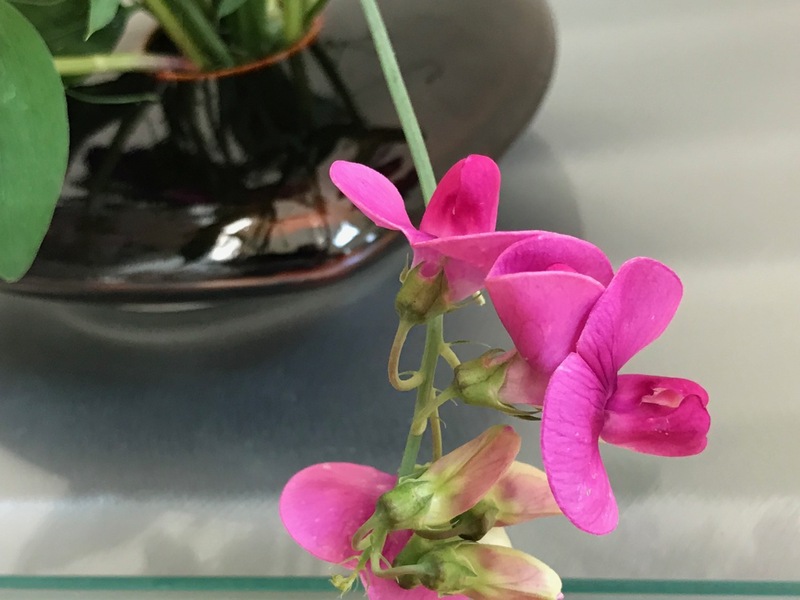 For color there are Angelonia and everlasting sweet pea. 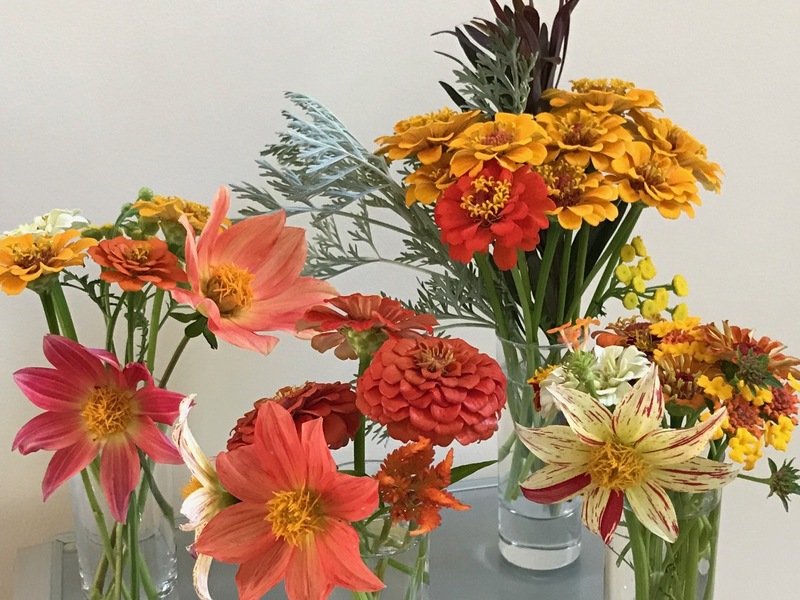 Hope your late summer garden is bringing you joy. 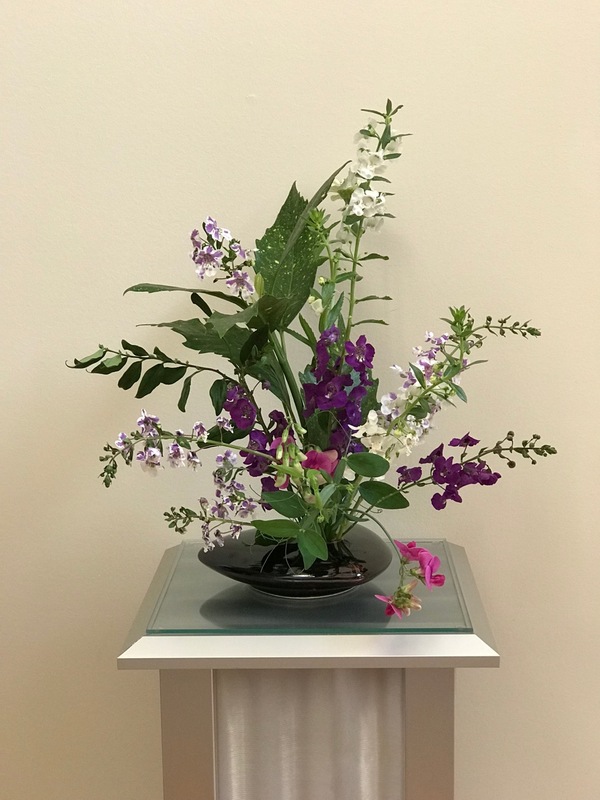 This entry was posted in garden and tagged 2018vase, angelonia angustifolia, Aucuba japonica 'Variegata' (Gold Dust Aucuba), flower arranging, flower design, in a vase on monday, Lathyrus latifolius (Perennial Sweet Pea), nature photography on August 20, 2018 by pbmgarden. 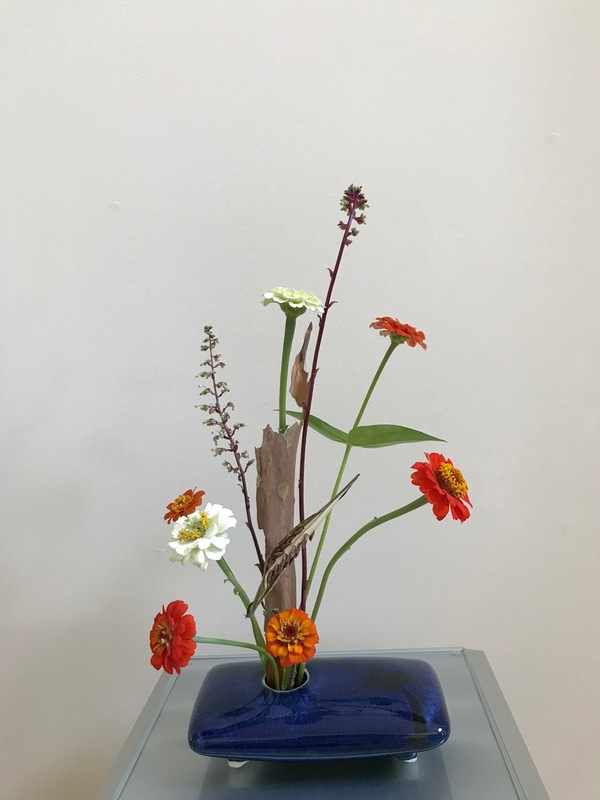 For today’s vase I chose a Raku pot purchased at our local Apple Chill street fair one autumn long ago, when five dollars was a significant investment. 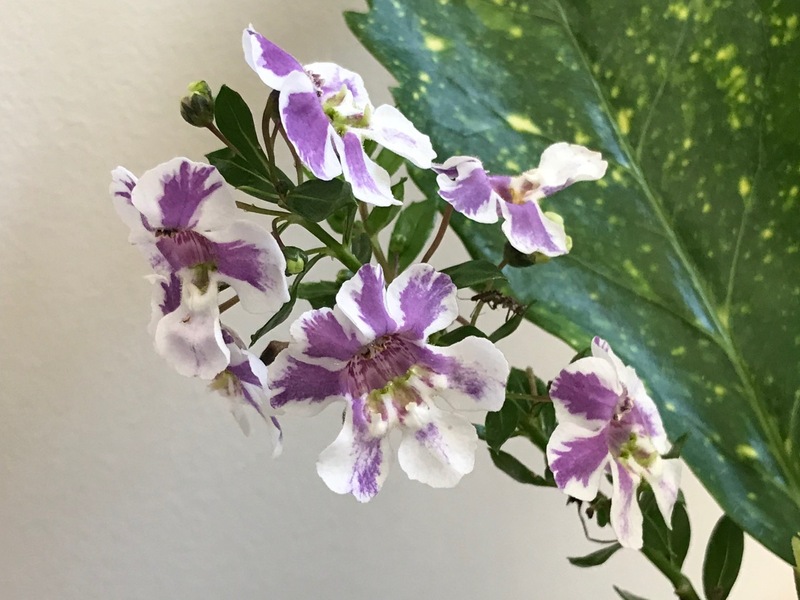 Reliable and trouble-free, Angelonia ‘Purple’ caught my eye as I looked around the garden yesterday for flowers to feature. 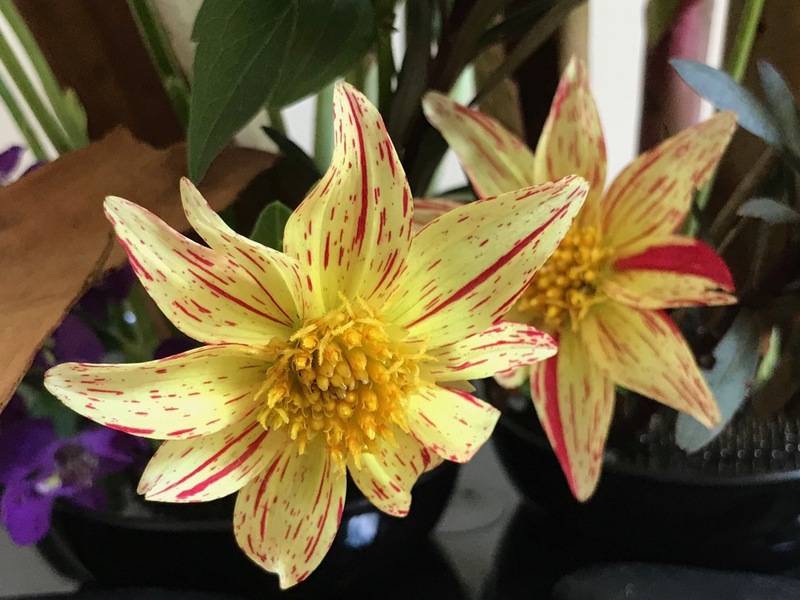 Also I included Dahlia ‘Fireworks’ because it is finally beginning to flower a bit more, though it remains rather lackluster. 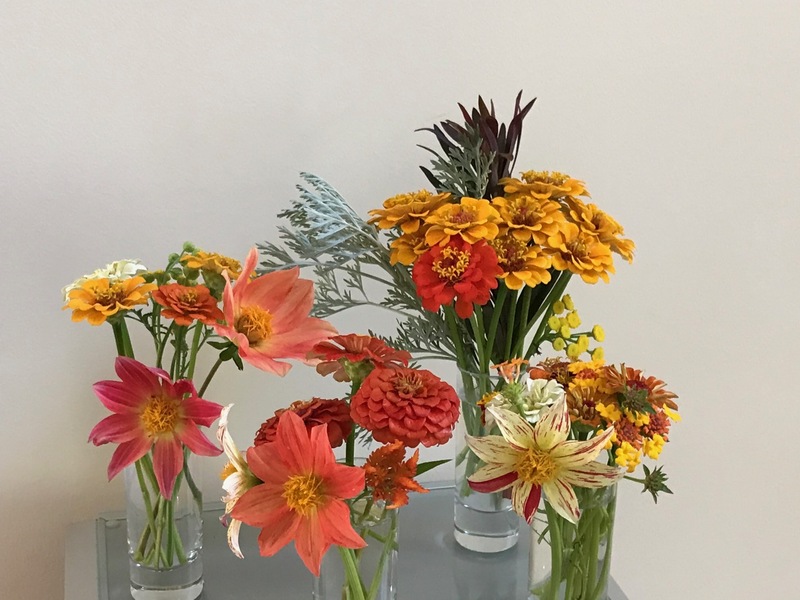 The three ‘Fireworks’ plants are the only dahlias in my garden this summer (my friend Libby’s mom’s red dahlia did not make it through our harsh winter). 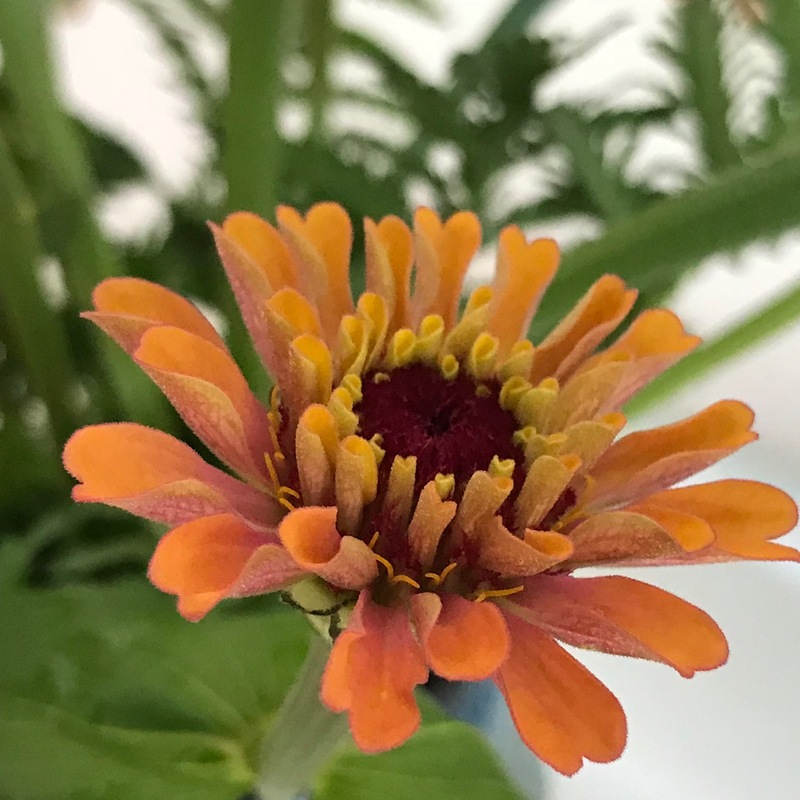 Zinnia Cut and Come Again continue to color the garden with fresh and long-lasting flowers, drawing hummingbirds, butterflies and other various insects. There is sign of powdery mildew on some of the leaves but the flowers power on. 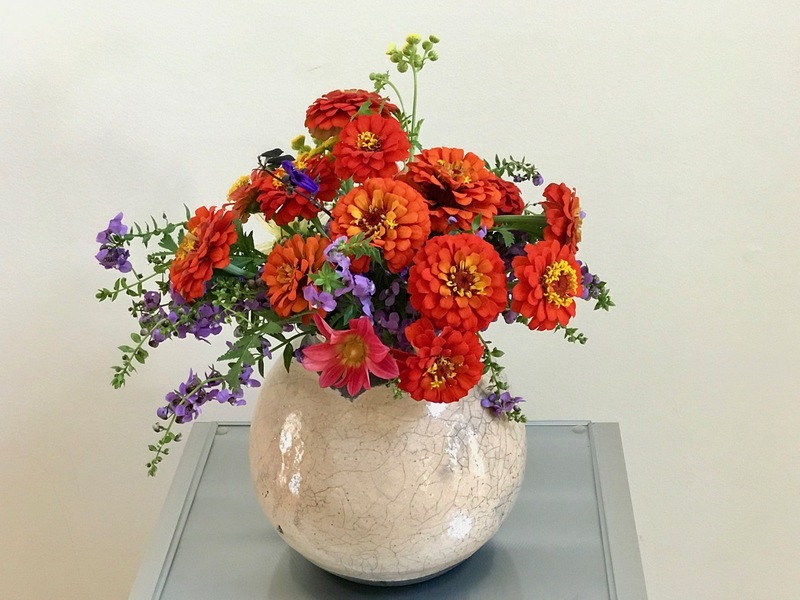 I used most of the zinnias I cut yesterday in a secondary arrangement, but several of the deep orange ones found their way into Monday’s vase, nestling among the purples of Angelonia and one stem of instensely blue-violet salvia. 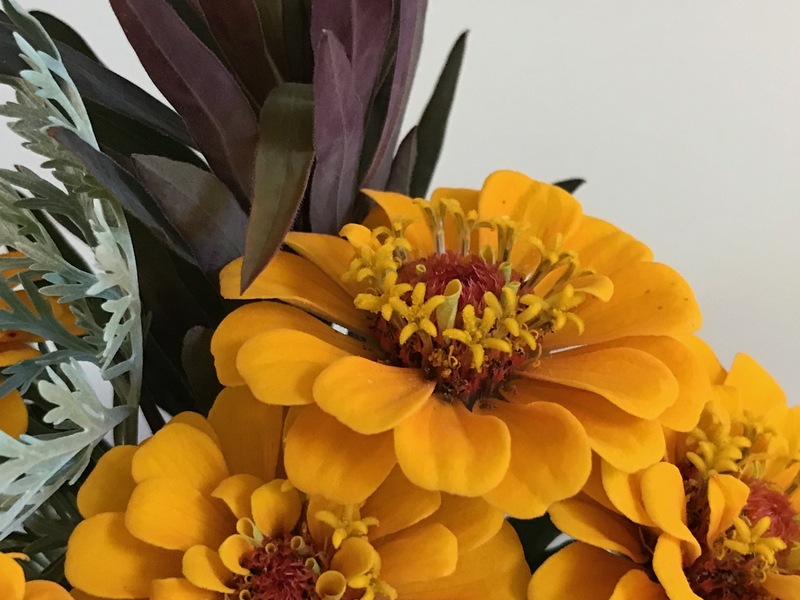 Two clusters of bright yellow Tansy flowers add a final touch. 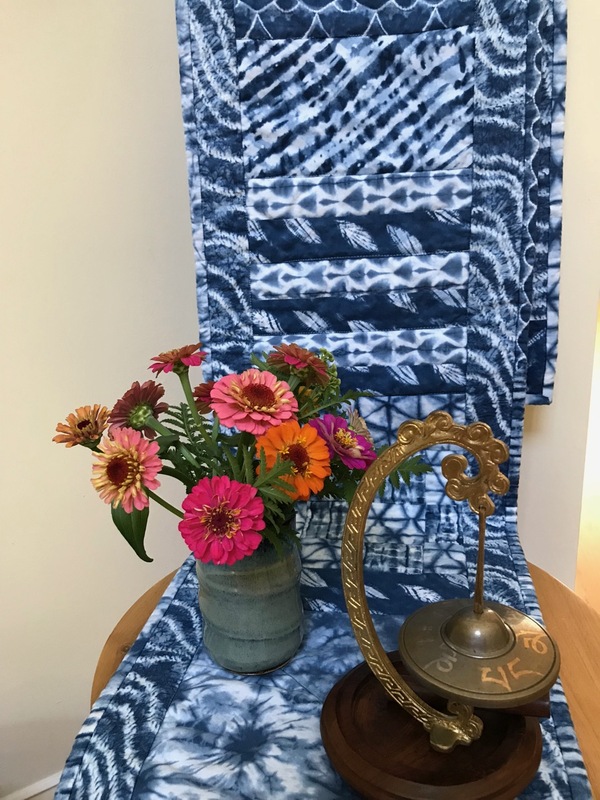 Many of my designs are viewed only from the front, but this one is meant to be seen from all directions. The asymmetry of this view looks more formal, yet gives a touch of personality. 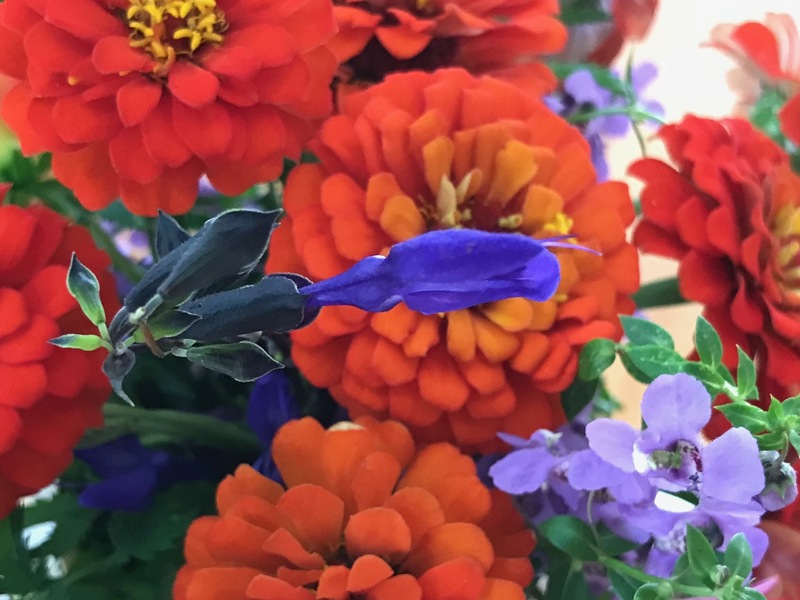 Some of the stems in today’s bouquet, especially part of the Angelonia and the dahlias, were not as long as I would have liked. 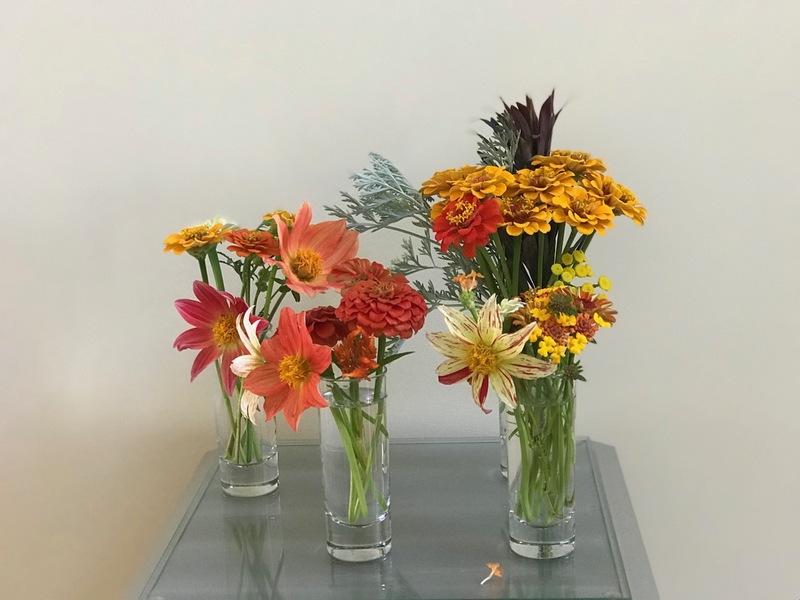 Concerned they may end of out of water at some point during the week, I decided after the photo shoot to trim all the stems evenly and place them into a different container. 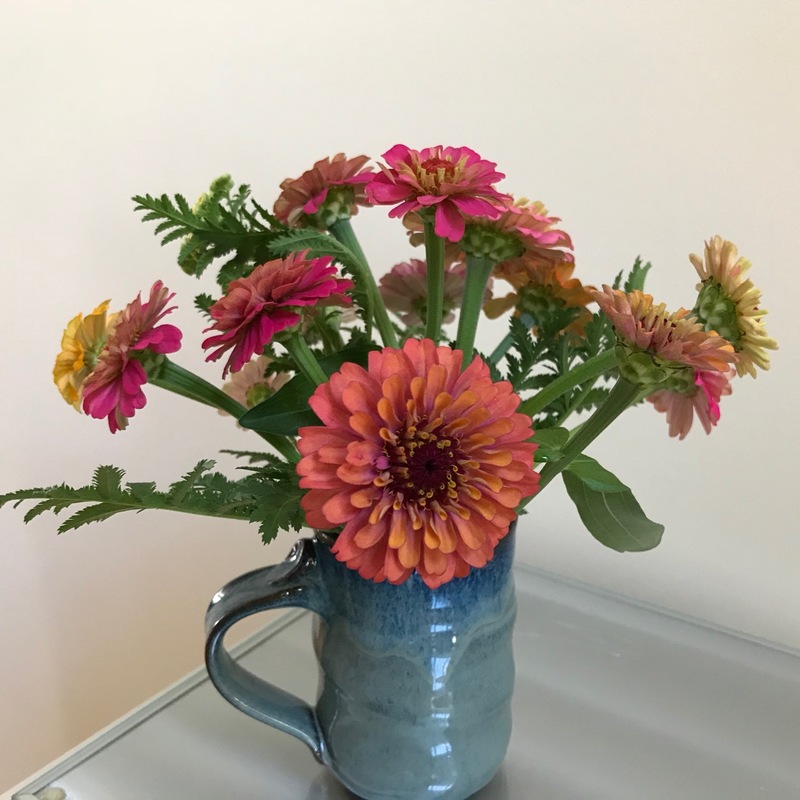 Looking freer in this casual soup mug, the flowers will provide a cheery presence this week. 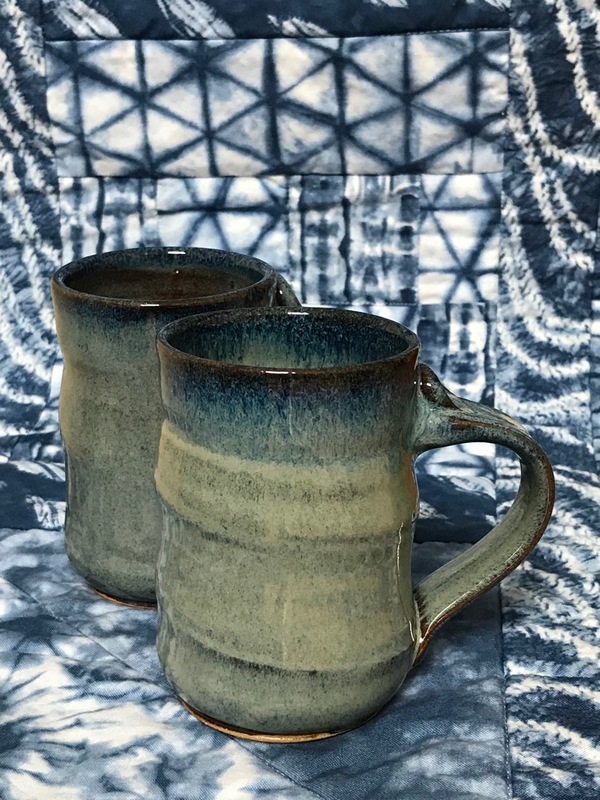 Raku ware, unknown artist, circa 1978. 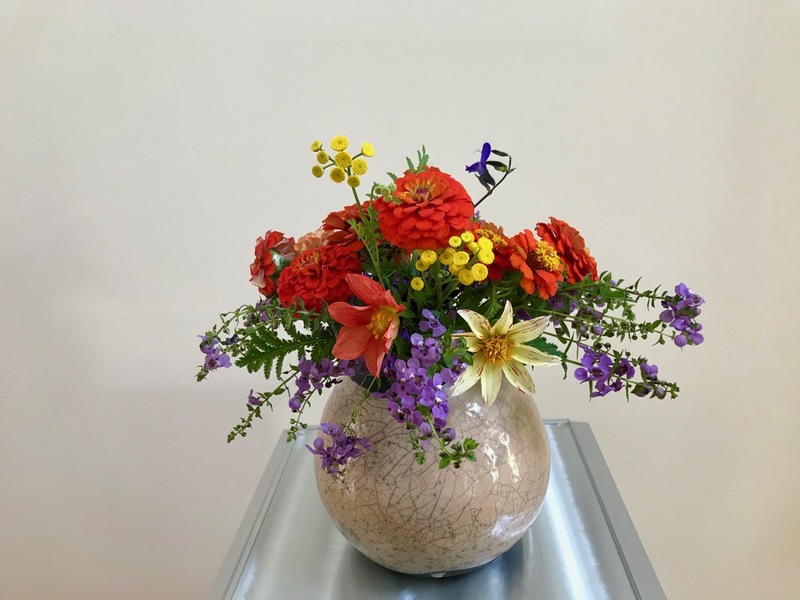 It is fun to share vases with others across the world. Thanks to Cathy at Rambling In The Garden for hosting each week. 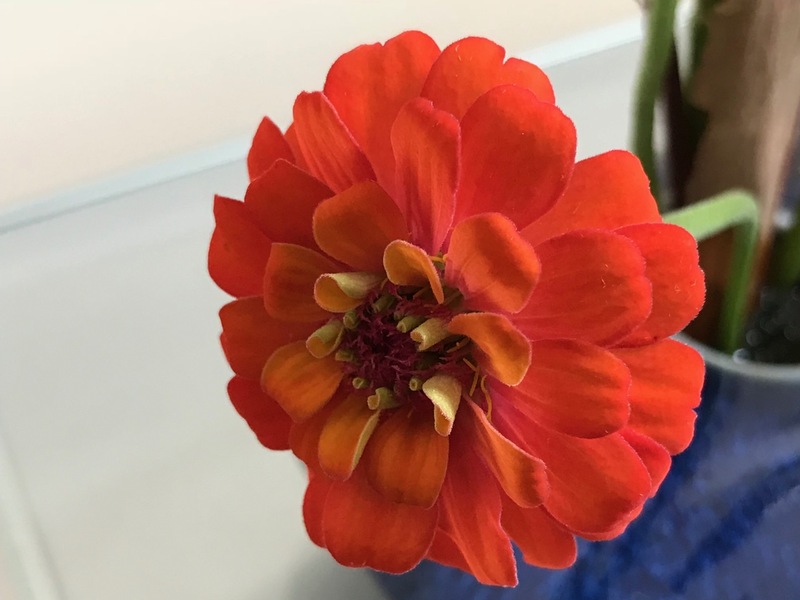 Visit her to discover what she and others found to place In A Vase On Monday. 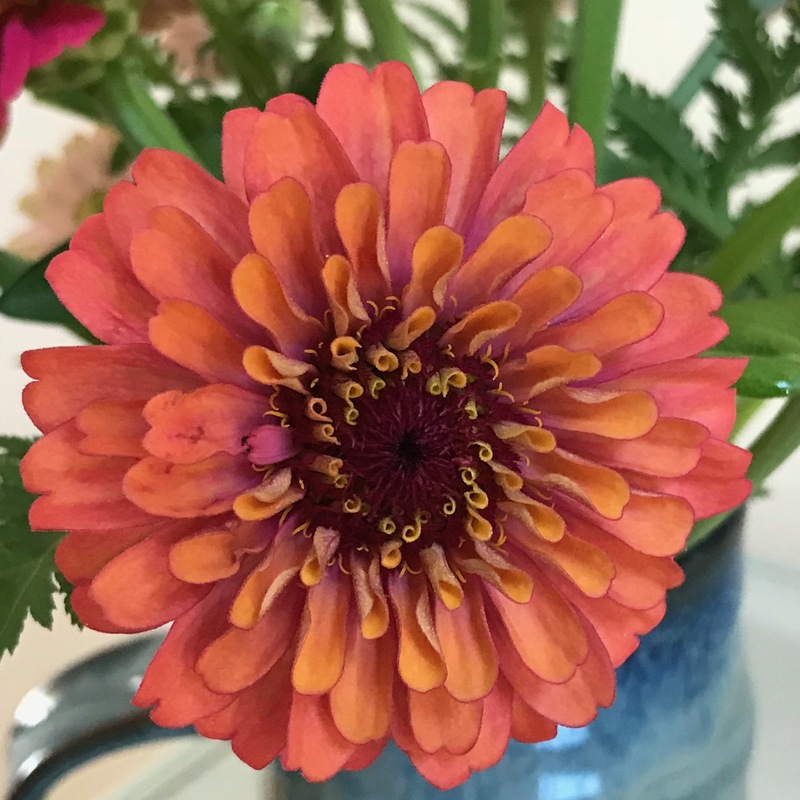 This entry was posted in garden and tagged 2018vase, angelonia angustifolia, Dahlia ‘Fireworks’, flower arranging, flower design, in a vase on monday, nature photography, tansy, Zinnia 'Cut and Come Again' (Zinnia elegant pumila) on August 13, 2018 by pbmgarden. 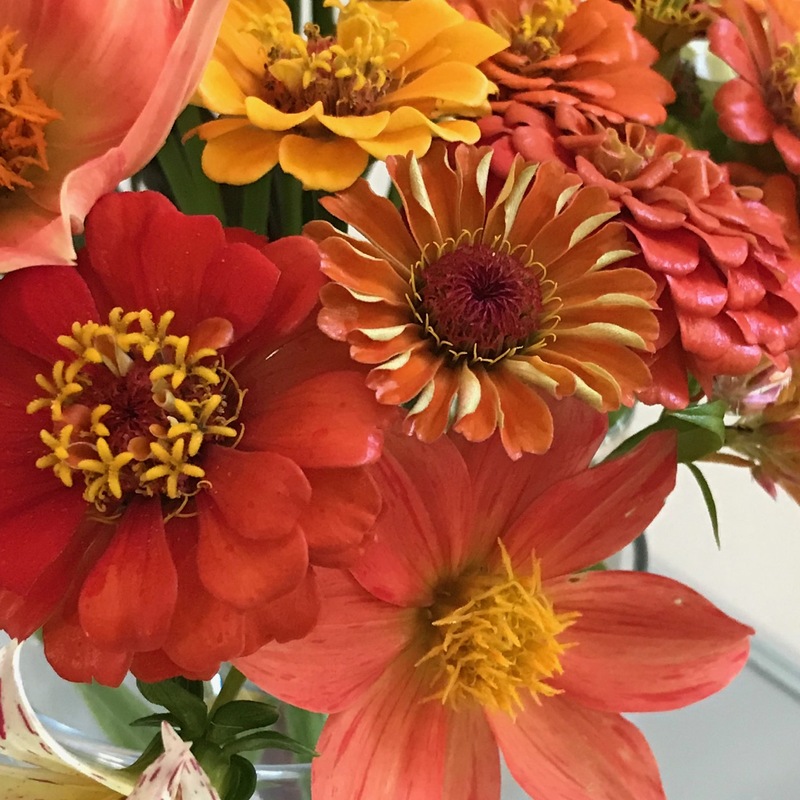 Zinnia Cut and Come Again are reliable for a profusion of summer blooms. 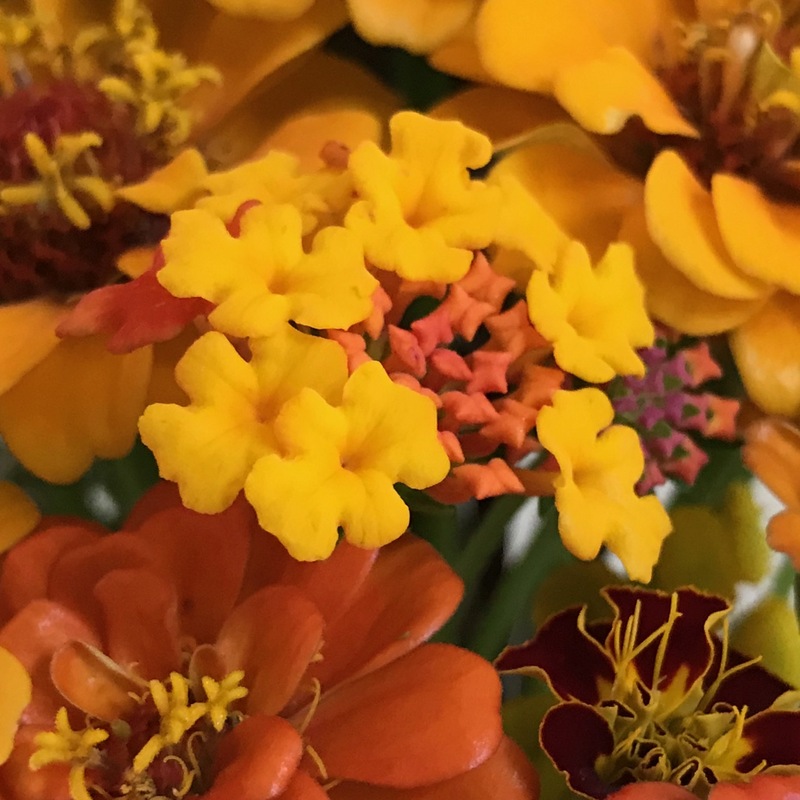 Jason mentioned his were mainly white and orange and coincidentally those are the two colors I had selected for today’s vase. I seem to have a balanced mixture of colors this year, but the white is rare among the reds, pinks and yellows. There are more oranges this year in the mix. 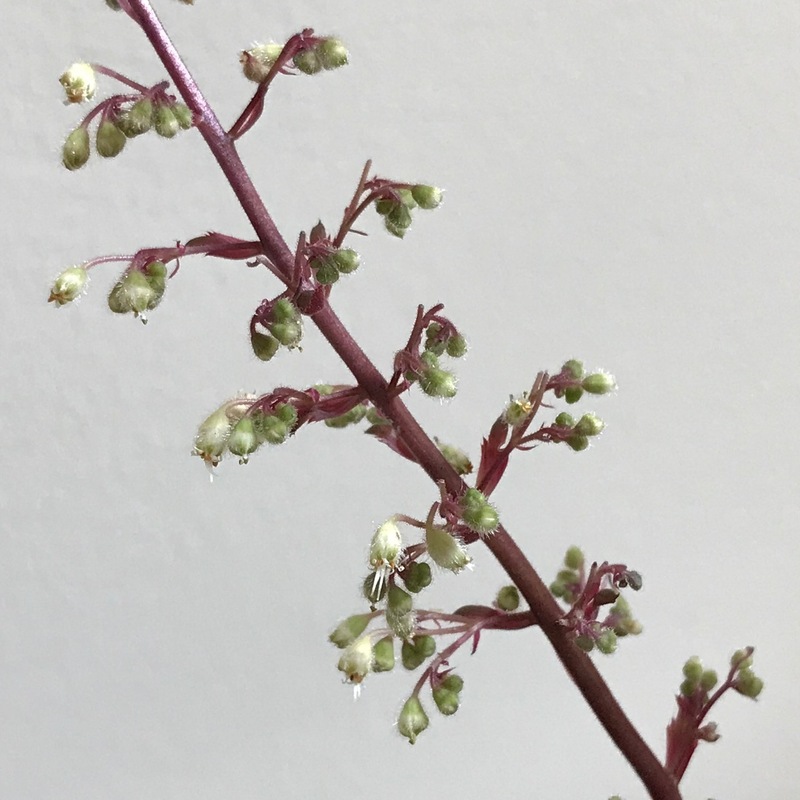 Heuchera villosa ‘Big Top Bronze’ is beginning to bloom in a dark corner behind other plants so I decided to bring a stem indoors. 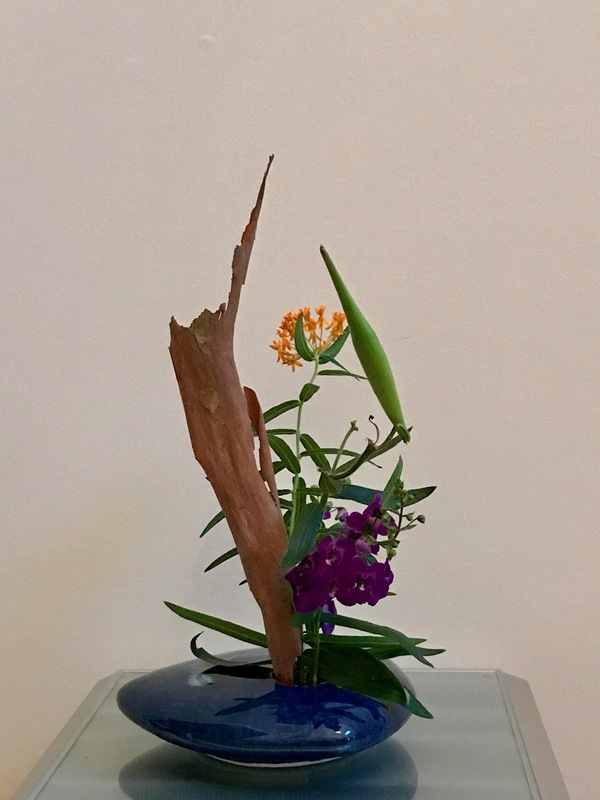 For natural accents I reused a piece of bark from a previous arrangement, along with a seed pod from Asclepias tuberosa (Butterfly Plant) from a few weeks ago. The pod has transformed and burst open. 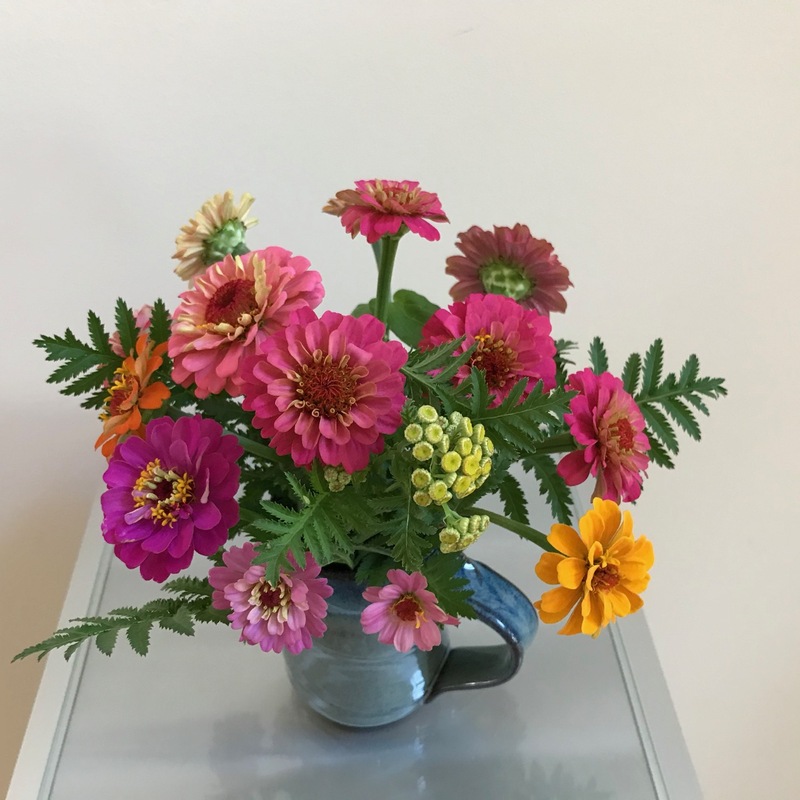 A bunch of zinnias make a great summer bouquet, but even in small number they have great presence. 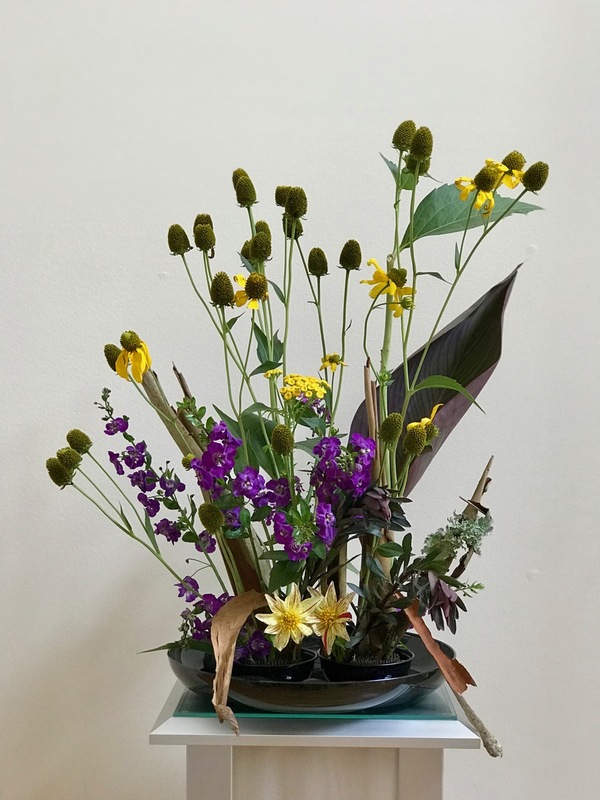 This entry was posted in garden and tagged 2018vase, angelonia angustifolia, canna, Dahlia ‘Fireworks’, flower arranging, flower design, in a vase on monday, nature photography, Rudbeckia laciniata (Green-Headed Coneflower), tansy on August 6, 2018 by pbmgarden. 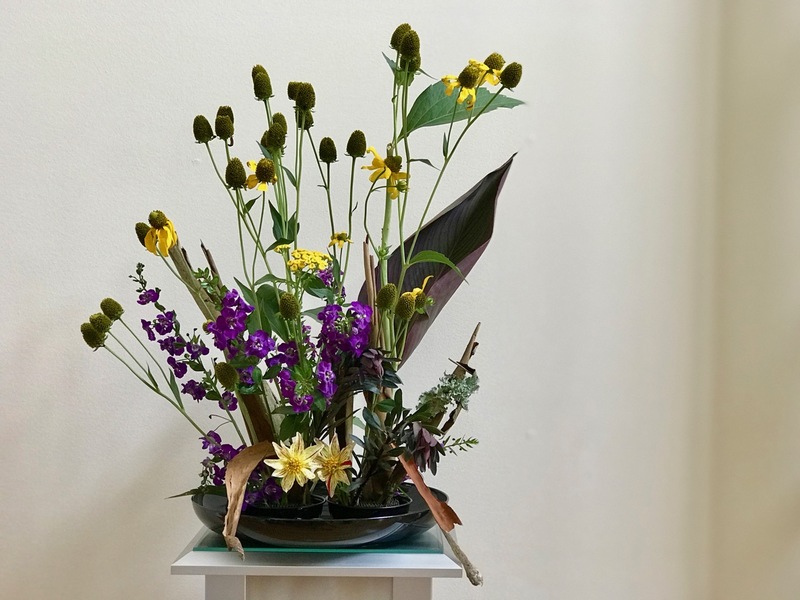 Before thinking consciously of today’s vase in terms of complementary yellow and purple, I had in mind tall stems of fading sunny Rudbeckia, the green cone-heads featured prominently, and backed by a large purply patterned Canna leaf. 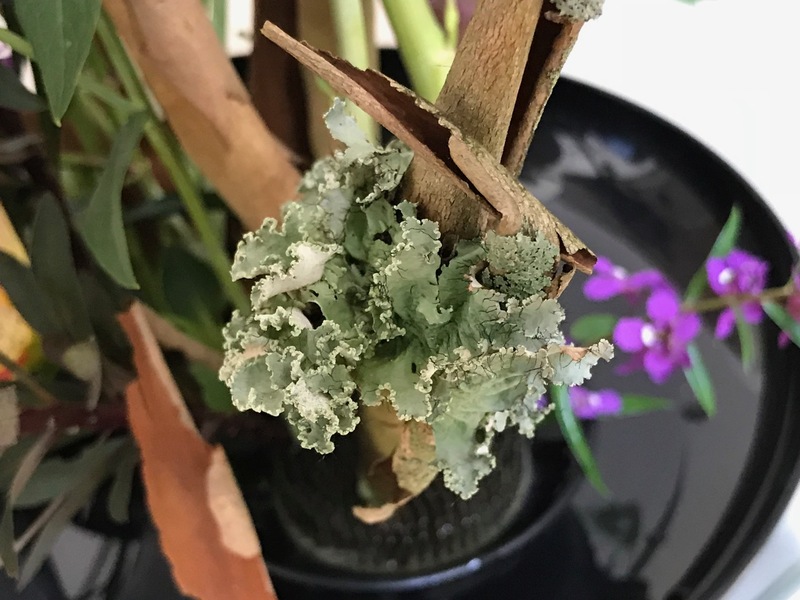 I also wanted to use pieces of bark saved from a Lagerstroemia (Crape Myrtle), especially this lichen-covered section. Using two floral pins or frogs I began by inserting the bark. Next the rudbeckia and canna went in as planned. 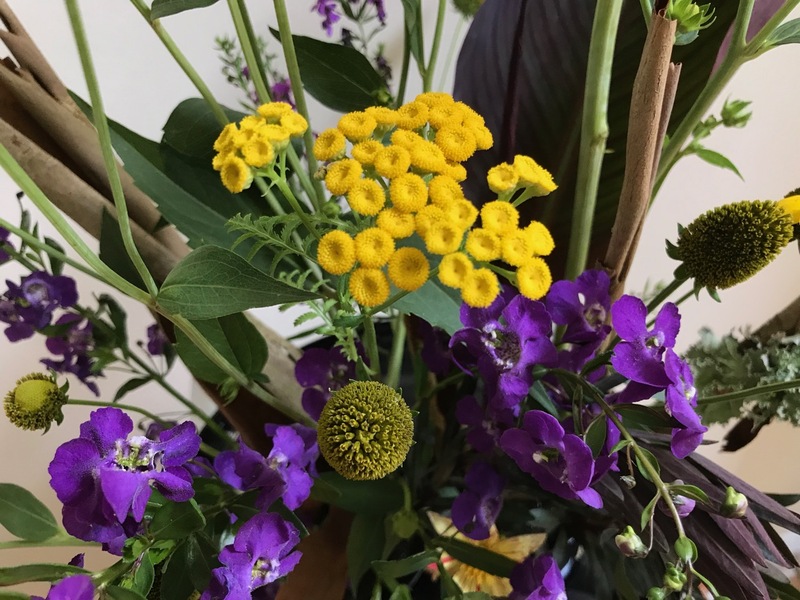 Before long I had rescued a stem of Tansy from last week’s vase for more yellow and more texture. 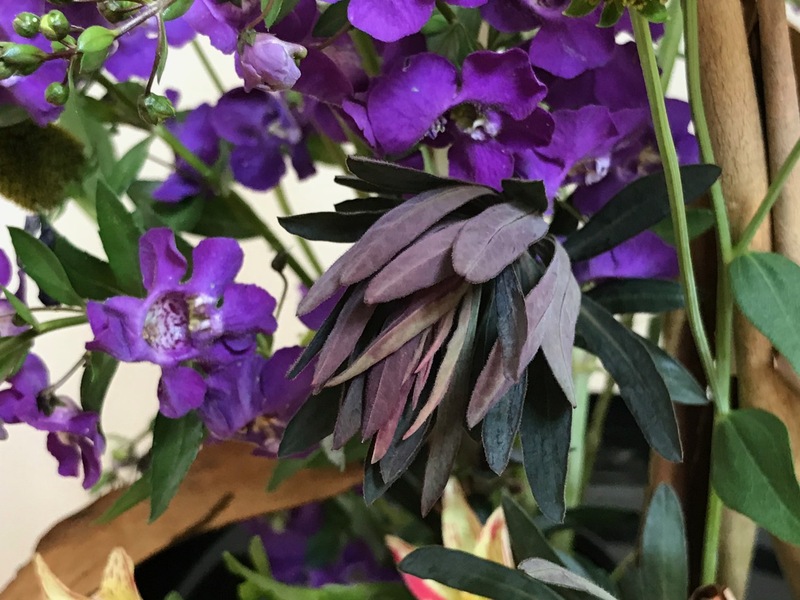 More purples slipped in—Angelonia and Euphorbia ‘Blackbird.’ Much of the bark which was expected to provide a strong impact receded in favor of the angelonia. 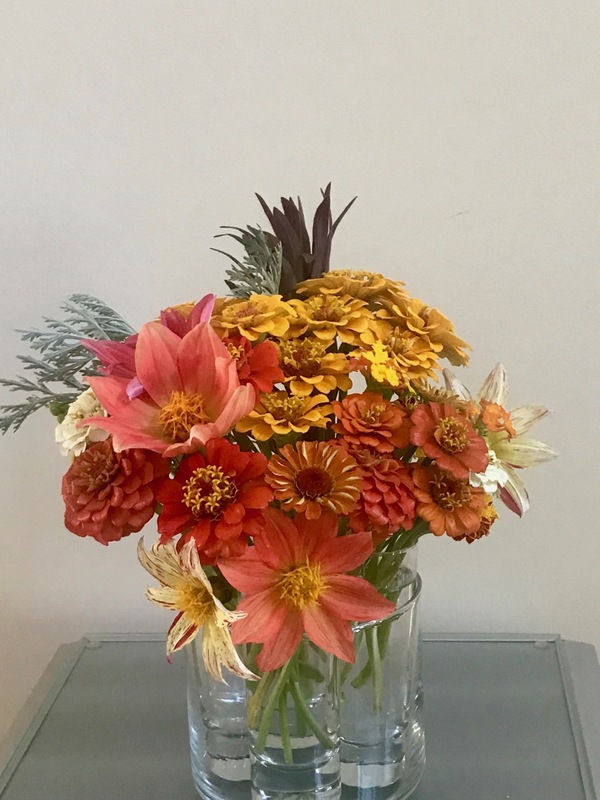 Dahlia ‘Fireworks’ has disappointed this year, giving only one or two blooms at a time, but the flowers called out when I was cutting materials and found their way into the design. 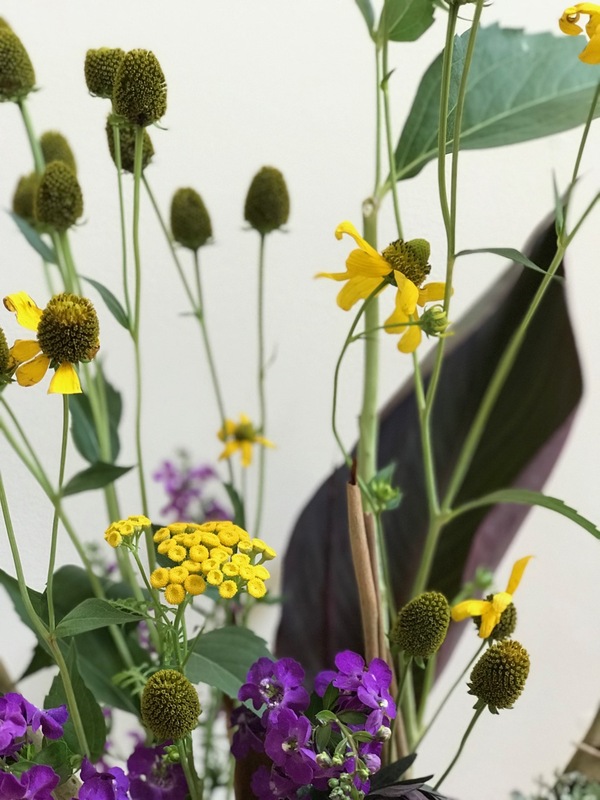 This entry was posted in garden and tagged 2018vase, angelonia angustifolia, canna, Dahlia ‘Fireworks’, flower arranging, flower design, in a vase on monday, nature photography, Rudbeckia laciniata (Green-Headed Coneflower), tansy on July 30, 2018 by pbmgarden. 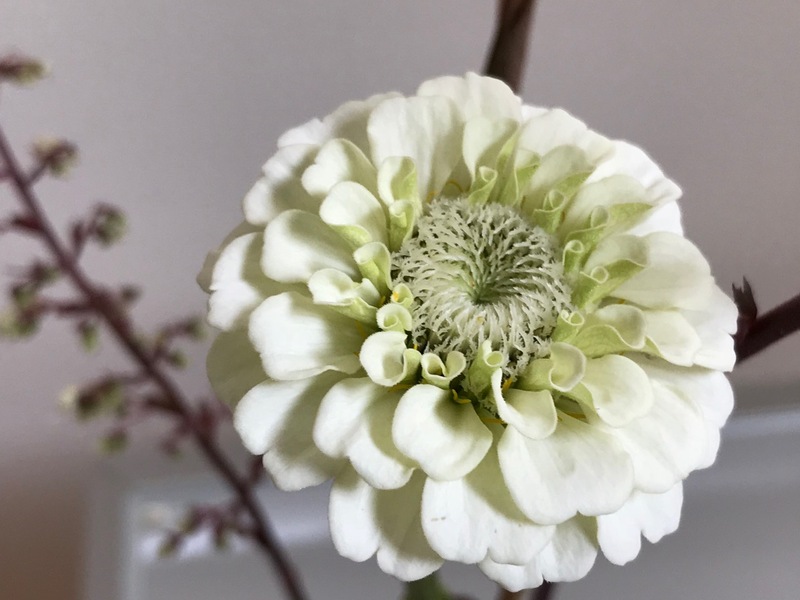 I look forward each week to joining Cathy at Rambling In The Garden, along with other garden bloggers from around the globe, in sharing an arrangement every Monday using materials collected from our gardens. 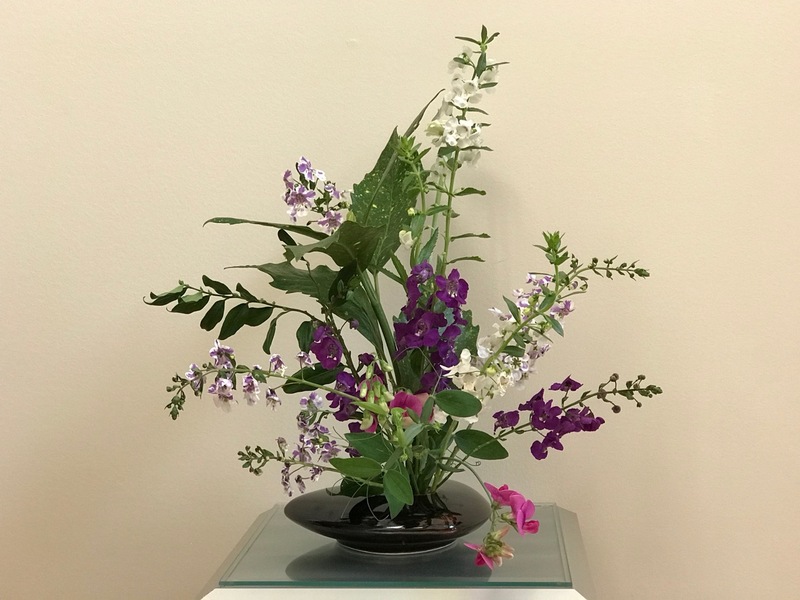 After enjoying an exciting and special time with family during the weekend, I quickly pieced together a simple Ikebana design for today. A few Asclepias plants are still blooming despite very dry conditions in the garden, but pods are forming as well. 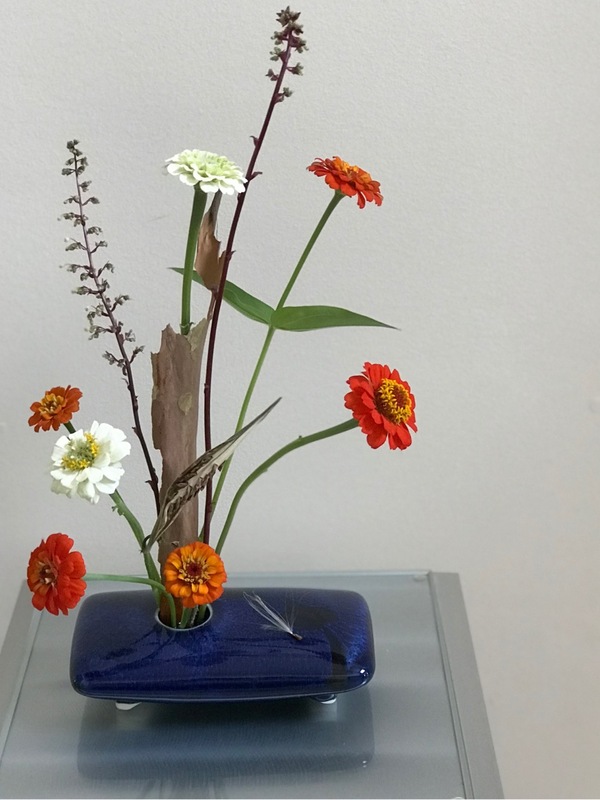 One seedpod and one flowering stem were the starting point for today’s vase. 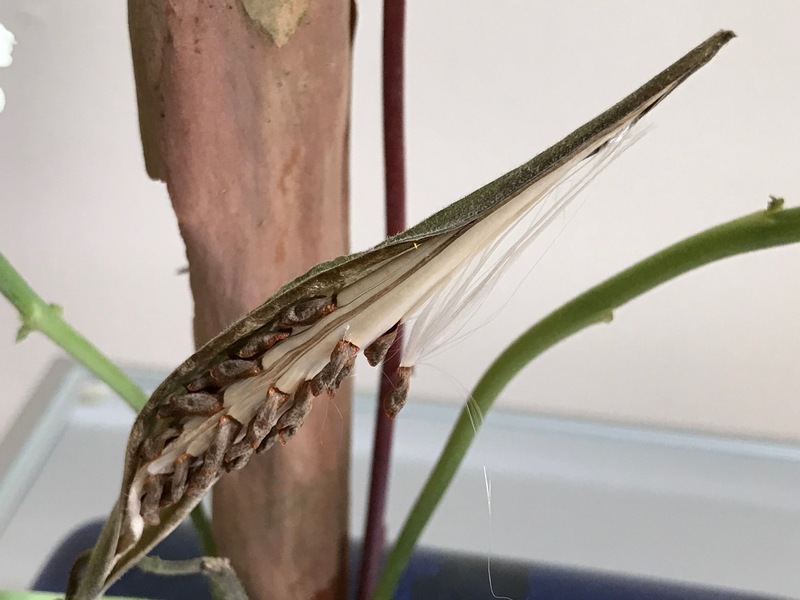 I paired the Asclepias with a section of bark from a crape myrtle from the front garden (another storm mishap for those of you who are familiar with the history of my poor trees–this one being a particularly galling incident considering how dry it is still). 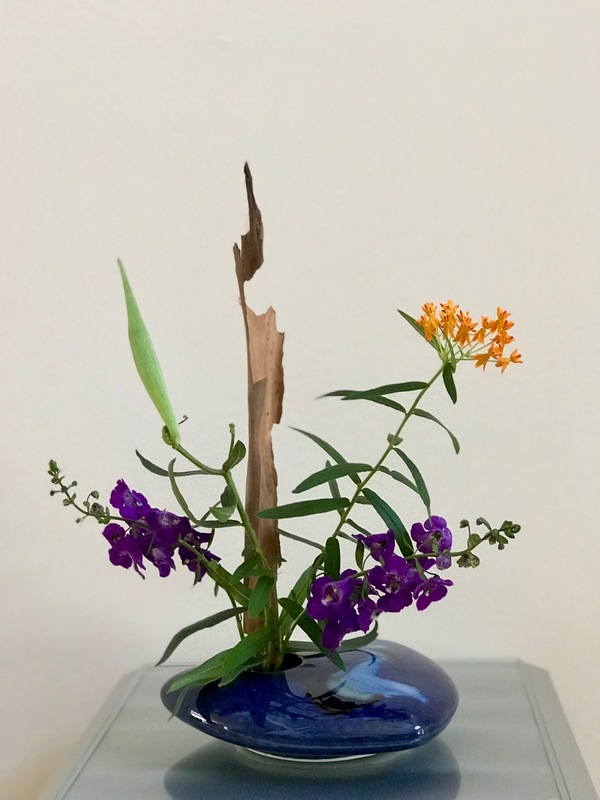 Just before photographing the vase I tucked in two sprigs of angelonia to kick up the color impact. 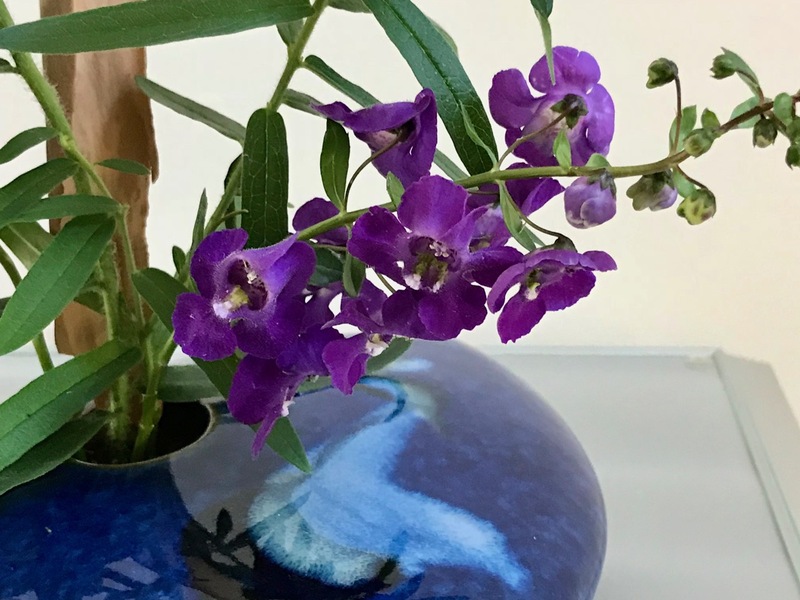 Angelonia is a great annual for summer color. 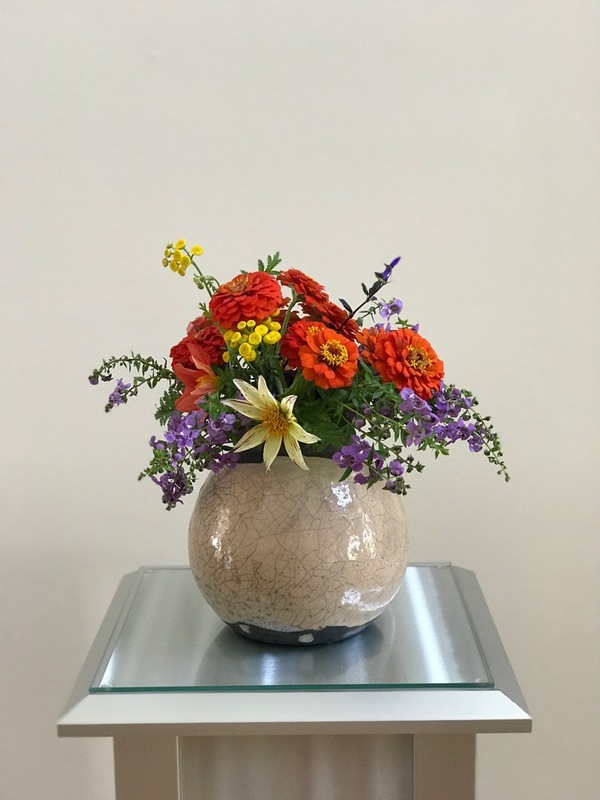 Walking down the hall toward this vase after I had already finished this post, I noticed the the design is much more engaging from the side, than from head on the way it was designed. More rhythm, more interest. If it were not so late I would be tempted to experiment from this angle, but there is always next week. I will finish with an homage to our little crape myrtle out front. 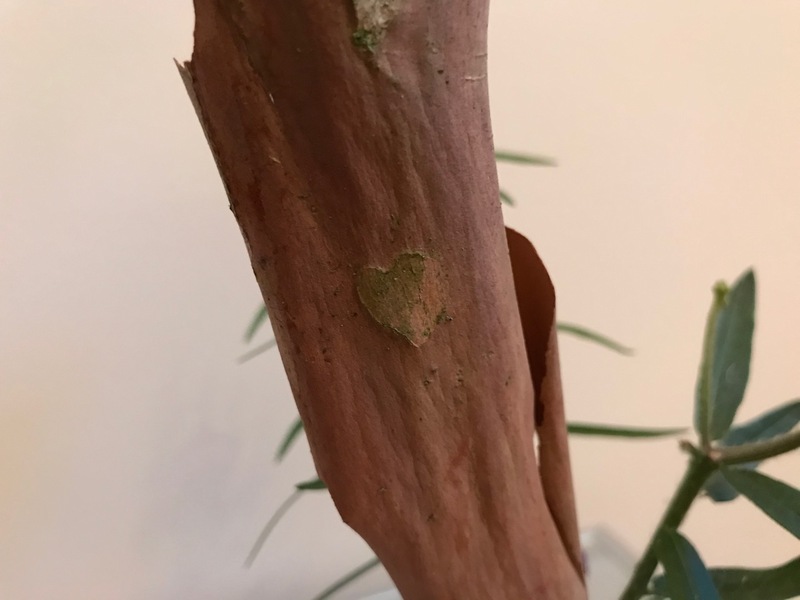 Until I photographed the bark I had not really noticed the little heart. I think it loves me too. 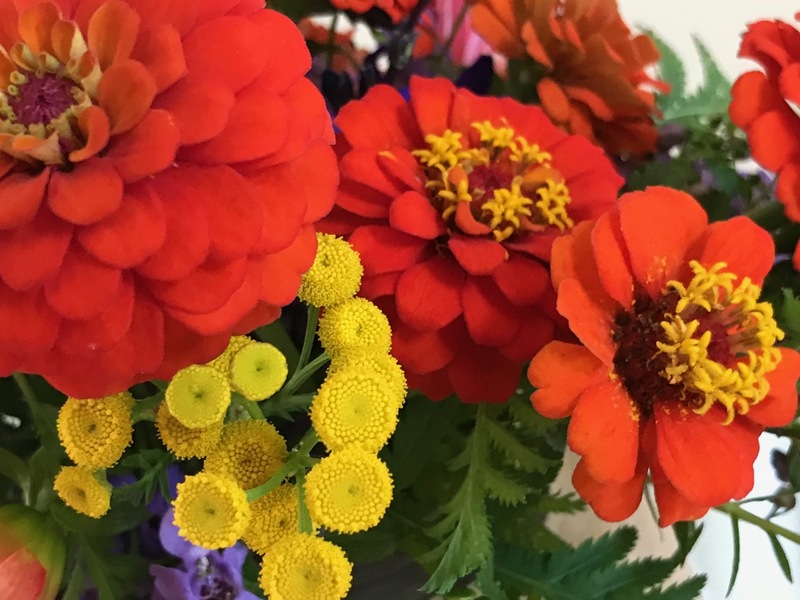 Thanks to Cathy at Rambling In The Garden for hosting each week, allowing us to share our passion. 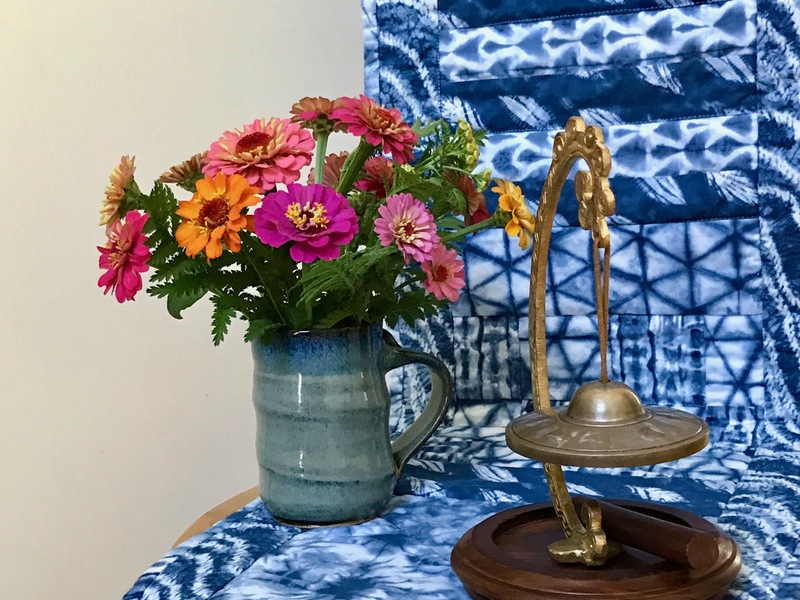 Visit her to discover what she and others found to place In A Vase On Monday. 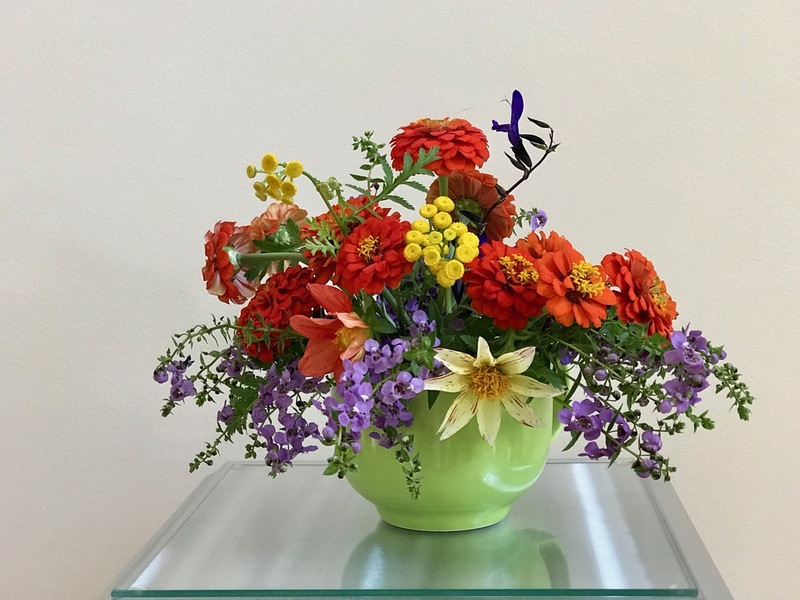 This entry was posted in garden and tagged 2018vase, angelonia angustifolia, Asclepias tuberosa (Butterfly Plant), flower arranging, flower design, in a vase on monday, nature photography on July 16, 2018 by pbmgarden.